Sani-Estrie and Gaz Métro announced that the first public refueling station for CNG has been set up in the Eastern Townships, the tenth such installation to join the Blue Road. Located in Sherbrooke and operated by Sani Estrie, this station will be accessible to the public, more specifically to transportation companies and municipalities who use or who wish to adopt this alternative fuel. “Economic recovery is a priority for our government. We want to modernize Québec’s economy through the energy transition announced in the 2030 Energy Policy. Thus, ensuring access to natural gas to as many regions as possible will enable us to achieve the objectives that we have set for ourselves. I am delighted about the installation of a public CNG station in the Eastern Townships, since the use of this resource will help promote this transition to a low-carbon economy,” said Minister of Energy and Natural Resources and Minister responsible for the Plan Nord, Pierre Arcand. 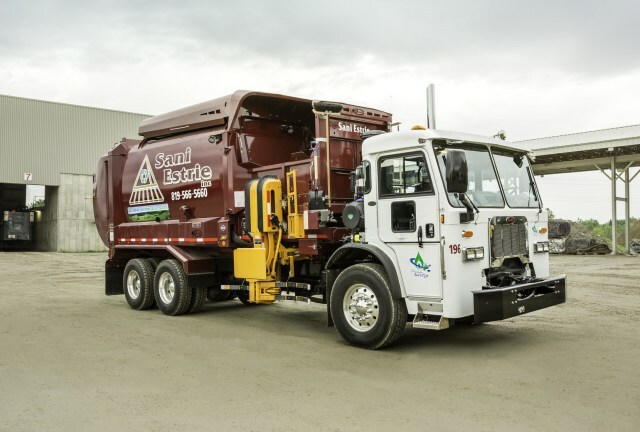 Sani Estrie made the switch to natural gas just over a year ago when it acquired nine new CNG trucks, with the goal of converting 30 more over the next five years. “We are very pleased to offer a new CNG fueling point for Québec-based and particularly local transporters, so they may benefit, as do we, from the numerous advantages of natural gas, especially from an economic and environmental perspective,” said Sani-Estrie’s Vice President, Sylvain Gagné. This new facility on the Blue Road, a network of public natural gas fueling stations, will allow companies who fill their trucks with this alternative fuel to travel from the Eastern Townships to Montreal and even to have the possibility of reaching the United States. “The proximity of highways 10 and 55 made Sherbrooke a prime location for pursuing the deployment of the Blue Road,” mentioned Martin Imbleau, Vice President, Development and Renewable Energies at Gaz Métro.